There had been a time when wheat, soybeans, potatoes, corn and rice had been the major foods of the human race. Now there was no one alive who had ever seen them. But they existed in the Life Bank, as did virtually every plant and animal that existed on Old Earth. Is there anything that we can do today? Yes! Our Patriot Seed Vault features only the finest survival heirloom seeds for a robust and hearty garden, even in the toughest of times. 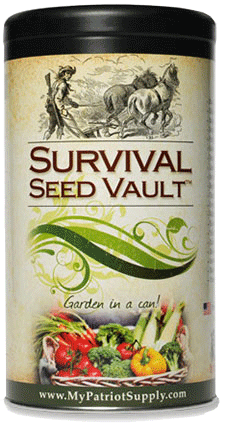 The Survival Seed Vault contains only the highest quality heirloom vegetable survival seeds. These Patriot Seeds are 100% Non-GMO, open-pollinated and placed in specially sealed packets allowing for long term storage. No hybrids, GMOs, or outdated survival seeds. All harvested seeds are reusable. Each seed bank is hand-inspected and packed by our American staff to ensure quality. Okay, I admit that it is rather limited; but, it's a start. Oh, and David Brin fans should not feel left out; you can also learn about Brin's genetic ark from his 1990 novel Earth. It's just $29.95; prepare for the future with your seed vault.